Andre Russell's second consecutive blistering knock made all the difference as Kolkata Knight Riders beat Kings XI Punjab by 28 runs in their second game at Eden Gardens on Wednesday. Russell, who hit a sensational 19-ball 49 against Sunrisers Hyderabad in KKR's previous match, bludgeoned his way to a 17-ball 48 to propel the home side to a massive 218 for 4 after being sent into bat. He later took two wickets for 21 runs to help KKR restrict KXIP to 190 for 4 and emerge as the undisputed star of the match. When on three, Russell was yorked by Mohammed Shami off the last delivery of the 17th over but to the horror of KXIP, the umpire signalled a no-ball as the visiting team was found to have one fielder short of the mandatory four inside the 30-yard circle. The 30-year-old Russell made full use of the reprieve as he hammered five sixes and three fours from the next 11 balls he faced to send the Eden Gardens crowd berserk. He was dismissed in the final over. KKR made 56 runs in 19 balls after the no-ball incident to score their highest IPL total at Eden Gardens. The KKR innings was lashed with 17 sixes. Russell though was not the top-scorer for KKR. Robin Uthappa took that honour, remaining not out on 67 off 50 balls while Nitish Rana was the one who set the Eden Gardens on fire before Russell came out with a 34-ball 63. The much-anticipated contest between two big-hitting Jamaicans from the rival teams, however, ended in a damp squib with Russell winning hands down against his much senior compatriot Chris Gayle. The 'Universe Boss' Gayle was out in the fifth over of the KXIP run chase with a small contribution of 20 off 13 deliveries. The Punjab side was in deep trouble early on as Lokesh Rahul (1) was also out cheaply before Gayle in the second over. It was left to Mayank Agarwal and David Miller to bring back KXIP into the game. But soon they found the target to be too stiff and by the end of the 15th over, the asking had raised to 17.2 runs an over. Agarwal was out in the 16th over for 53 off 34 deliveries while Miller stayed unbeaten for a 40-ball 59 not out with the help of five fours and three sixes as KXIP fell short by 28 runs in the end. 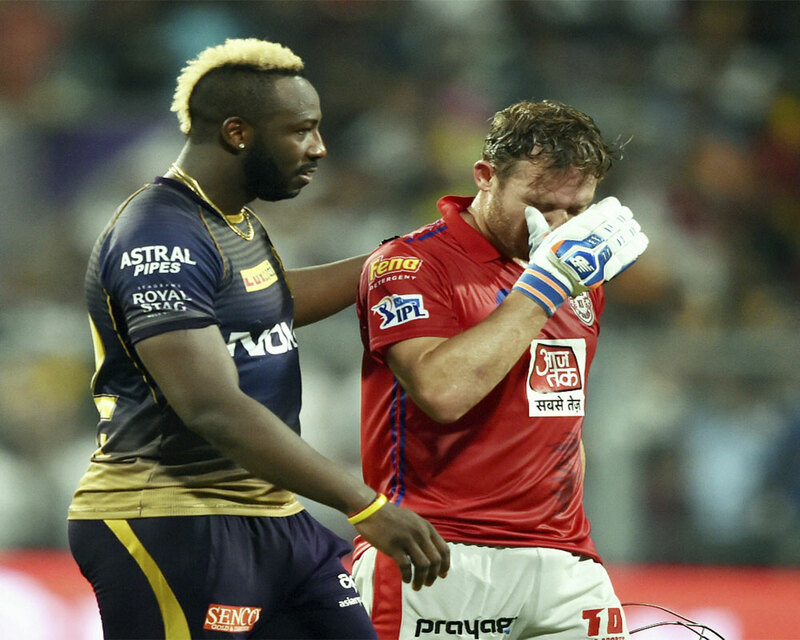 There was also some drama in store in the sixth over when the game was halted for a while with KKR skipper Dinesh Karthik and Robin Uthappa engaging in an animated discussion with the umpires after KXIP was awarded five runs from an overthrow. Earlier, playing his first match after the 'Mankading' controversy, Kings XI skipper Ravichandran Ashwin found the going tough after he opted to bowl with Sunil Narine unleashing the fury early on with a nine-ball 24. Varun Chakravarthy (1/35), who fetched the joint-highest bid price of Rs 8.4 in the IPL auctions, found it tough in his debut match as Narine smashed him for three sixes and a boundary in his first over.